I just watched Titanic (again). It is just as moving the 5th or 6th time watching as it was the first. Maybe more because I get to see all the little details that are sometimes missed in a movie so awesome and rich with characters story and scenery alike. As the boat was going down and they showed all the people- some still clinging on to their suitcases, money and belongings, some clinging to each other, the couple who stayed in the bed, the mother who read to her children one last time, the captain who went down with his ship and the many who were scrambling to survive- I wondered what I would do in a situation like that. Would I be grace under fire or scramble for my life? Would I accept my fate as death and be at peace? I felt so sad when Jack died. They were so young. And so many real young people died in the real Titanic. Such a tragedy. But as a love story it was truly beautiful. I hope to grow old with my husband but as a nurse I know that life is so fragile. We truly need to appreciate every moment that we have with each other because NO ONE expects death to come when it does. Even when it’s expected- it’s still somehow a shock and you always wish there was more time- just a little more time. Watching Titanic reminds me that short or long we need to appreciate the life we’ve been given. I need to make the most of my life, be happy for what I have and thankful for each day. I never want to waste my time being angry. I want to forgive and forget the bad times and cherish and remember the good. I hope to spread a little joy and peace if I can. I don’t want any regrets since I will only pass this way one time. Did you catch Titanic this time around? 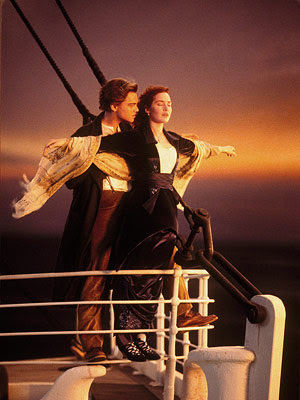 My 8 yr old son is obsessed with Titanic right now – so I’ve had the guilty pleasure of watching it a lot lately!! He was so excited to go see it in 3D at the theatres and now we own it at home………..he sings along with the song, watches videos on YouTube and can recognize the songs from the soundtrack just from watching, it’s great! Great flick! !